While walking around Epcot you run into random shows that are pretty great. Here is one example of that. 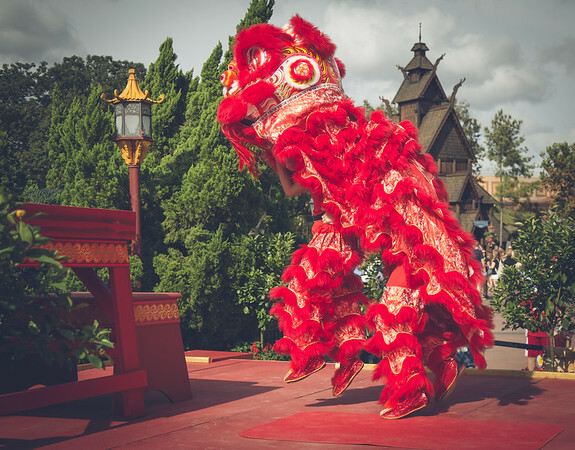 While walking through China we stumbled across this great show where two dancer act as one dragon. It was great to watch, and really was impressive. Both dancers were very good at what they did, and they showed great athleticism as well. These are the little things that Disney does that makes the trips there so special. This was a photo that I passed over for some reason during the initial edit. It did have some distracting elements on either side of it, and I used to be married to the 4×6 ratio. Maybe that was the problem. Two years later it is hard to remember why you passed over an initial photo. With sports photos I am very harsh on what I keep and store for years and years. My vacation photos for some reason don’t face that kind of scrutiny. Maybe that is because it is much easier to find the good sports photos. You look for the peak moment or a moment of some kind. The rest are gone. On vacation it seems like you are always choosing from very similar moments. Luckily I don’t always trash everything that I don’t initially find so something like this can live to see another day.